Welcome to March, where the weather is just really confusing. We had a snowstorm earlier this month and then we've had a few days of 70 degree weather. My sinuses are confused (sniffles everywhere), my brain is confused (why is it so dark when I wake up? ), and my wardrobe is confused. I am so ready for spring clothes, but it's just too cold, so I am coping with a little bit of florals peeking out from my sweater. How do you cope with this crazy March weather? Public speaking just has a way of making you feel uncomfortable and self conscious and oh yeah a group of people are watching you work through those emotions at the exact same time you're feeling them! Not always my idea of a fun time. I found that I was pretty decent at public speaking when I was younger and ironically less self-conscious. It's as I've gotten older and let my insecurities creep in more often (also being judged by colleagues/bosses is a bit more intimidating than other students) that I tend to get more nervous. 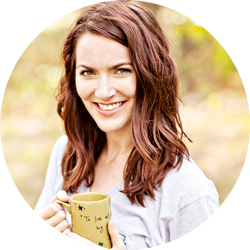 That's great that the course helped you improve with this skill (and yay for blog videos)! I always find it interesting to see/hear what a blogger is like in real life after I've been following them for so long. I would die. I barely made it through public speaking in college, so I definitely support the top fear statistic. I've been bitten by a copperhead snake and would still relive that experience if I could choose between that and public speaking. And now that I made that all dramatic... ;) I like the floral peeking out of that sweater. I'm so SO ready for Spring to get here already! Way to go on giving three speeches! Loving the simplicity of this look! Public speaking is not easy and not comfortable. I feel okay about it now; I mean I've had enough practice as a teacher. I also feel like I keep being required to speak to groups of adults about different things lately, so I'm warming up to it. I really feel it's one of those things that become more comfortable with practice. I really love the simple layering here with your cute blouse. The cut of this sweater is also really nice. That sweater looks SO cozy! Can I wear it? I love the little pops of floral peaking through. I think it helps transition from winter to spring. So so pretty! I hate public speaking, or pretty much any situation where I have to be singled out in front of a large group. I had to take a speech class in college, but that didn't really help at all! Luckily I'm not in a career path that I will be doing public speaking any time soon :) Love the outfit! Public speaking can always be hard. Even at school meetings I get nervous! 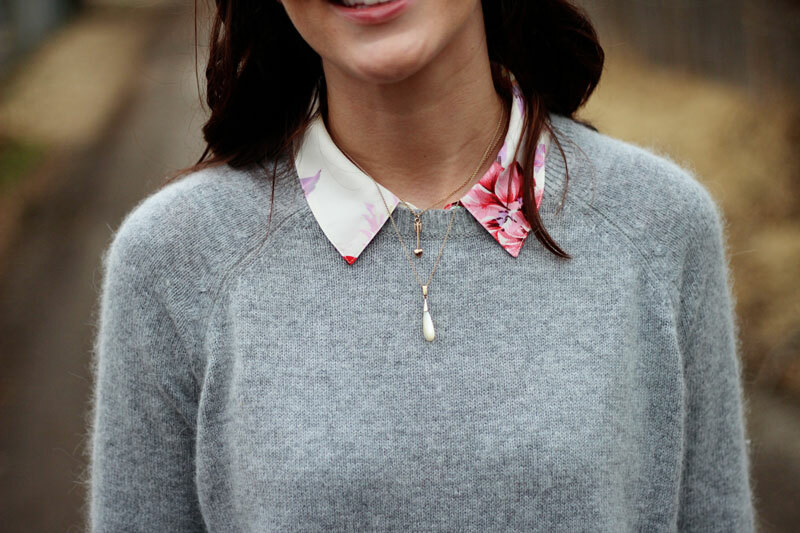 I love that floral button up and your layered necklaces! I get really nervous and shake a bit but I can get through it. I took a class in college that helped but still shaky. I don't mind public speaking but I'm super afraid of snakes! This outfit looks so cozy, and I join you on the sniffles front. Good for you! Public speaking is very tough but practice helps as does knowing your topic well. Love the florals. Maybe it will urge spring to come out of hiding permanently. The peek though of the floral on the collar is just choice! Love it. I feel your sinus pain. My head is a mess! I can't wait to get past this weather and pollen and get to consistent temperatures. 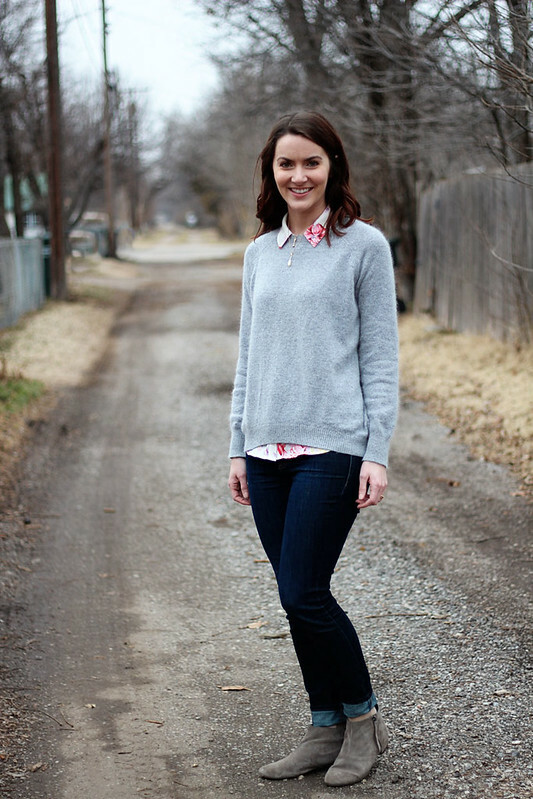 The floral blouse is a great touch making this outfit so soft and feminine. I used to do a lot of company presentations and I loved it, not sure how I would do these days. I am very much out of practice and what I used to find super exciting, now it makes me sweat. Every now and then when I can tell my students grow weary of listening to me, I offer them the chance to take over the class. Oddly enough, no one ever takes me up on my offer. Now I know it's because they're a bunch of scared-y cats. Anyway. I'm really into the idea of grey and florals together, I don't know why, but I've found myself with a bunch of grey + floral pins. I really am digging this outfit. Sorry to hear you're confused. I started to feel happier when the warm front came in, but now I'm back to being moody. Talk about a no-win! Ooph public speaking is such a hard one. good for you though! My wardrobe is always so confused this time of year, too! All I've been doing this past week is layering button-ups under sweaters. I'm done with this weather, totally and completely. On the plus side, you look cute and you aced that speaking course! This outfit looks some comfy cute. I love it! These booties are perfect by the way. I can't stand the weather lately. It was beautiful yesterday and today....we're having a snow storm. I mean, REALLY?! Public speaking is such a valuable skill to have, so I'll bet you'll learn a lot. I think I was better at that when I was younger than when I am now...probably because I know what I'm saying is under greater scrutiny than it was in school. I love this "confused" look bc I'm feeling the same thing these days!! Ha! You look beautiful! This weather...right now it's great but we had snow last week and then 60 degree days! I wish it would make up its mind. You look gorgeous. I love that little bit of the floral that is peaking out. The jeans and sweater fit you so nicely---I would wear them all the time! 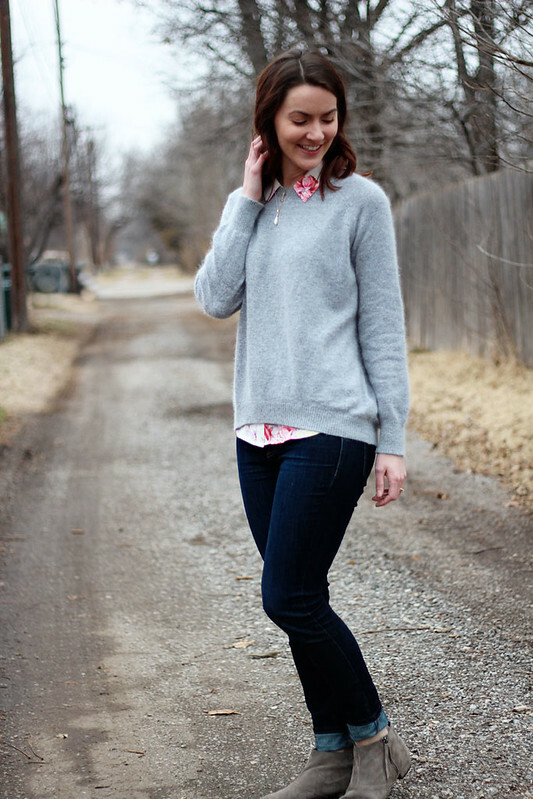 Love the simplicity of this outfit - pinning now! 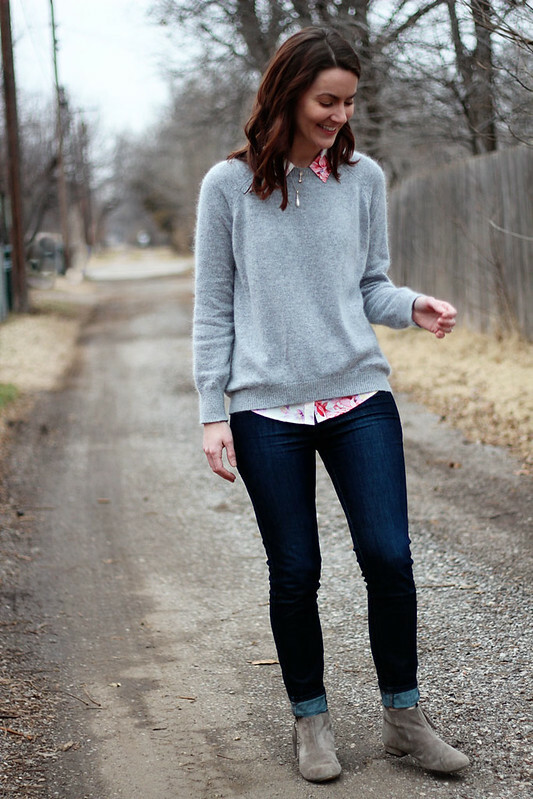 I love outfits like this, comfortable & casual yet totally put together! I hate public speaking. I don't like talking much period. :-) The weather is confusing here too. It feels like summer. First of all, you look totally adorable! Secondly, holy intense crash course!! 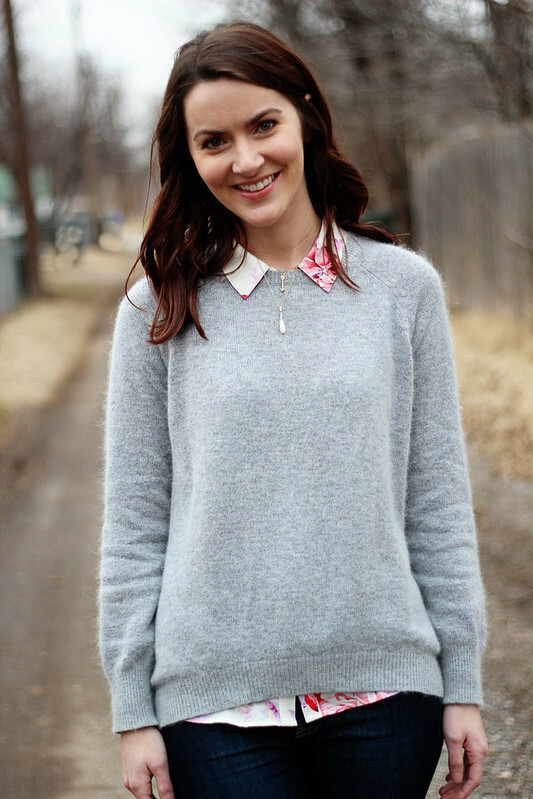 You look adorable combining a little bit of Winter (the Sweater) with a little bit of Spring (the Blouse). I want a Floral Button-down and a Floral Pencil Skirt. Something with pretty, bright roses. And I super love all the photos in this post. You look gorgeous. I am not stunned to find out about the fear of public speaking. I am super scared of snakes though (I think - I have never been near one though).